Elegant and refined without being pretentious and stuffy, it is a great example of traditional British food in a London eatery. The buzz and ambience make it best for building relationships, and negotiating or deciding the finer details of a deal. Go for the rib-eye steak. The restaurant prides itself on its selection of suppliers, so expect Cornish fish, Banham chicken, Barbary duck and Blythburgh pork. It is the newest hotel to open as part of the Soho House Group. Head chef is Steve Tonkin, whose CV boasts restaurants such as The Ivy and Wentworth. Don't be put off by the traditional English desserts; pear bakewell pudding or the banoffee ice cream are so nice on a summer's day. If you avoid the costly porterhouse steak and the specialist French wine list, you can enjoy two courses for less than £30. 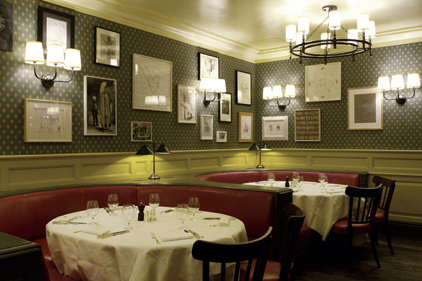 Dean Street Townhouse, 69-71 Dean Street, London, W1D 3SE. 020 7434 1755.